Thanks so much to Rebecca of Ella Minnow Pea and The Pink Orange for coming back to share a little more of her home today (remember her nursery ?). Today's makeover is an example of just what a difference a little bit of white paint can make to transform the entire feeling of a room. Off to you Rebecca. Thank you so much Mrs.Limestone for allowing me to guest blog again! My husband and I have been pecking away at our home project list. It can sometimes be challenging when you aren't 100% qualified DIY'ers. We think we are, but sometimes get in over our heads. That is why i just love visiting Mrs. Limestone's blog and so many other talented DIY blogs. I get inspired to take the leap and try something i might not ordinarily try. You know... the whole out of the comfort zone thing. Well, my husband and i had our fireplace on our list for quite some time. Actually, since day one of moving in. Yup. Real brick, but so fake looking. Not much depth or variation in color. Plus, we get so much shade at the front of the house where this room is, that is just darkens the room that much more. We also had painted the wall red (what were we thinking) when we moved in as an accent. Yeah, not so great once we lived with for awhile. So we decided to pain it to match the rest of the walls in the room. Check this beauty out. I know you see my husband scratching his head thinking..."Dear lord, what did i agree to?" And believe me, we don't drink and paint. Those wine glasses in the foreground were from the night before. I think we rose at 6 am to get this started early. I also wish i could say that the wall doesn't look that bad, but yeah, it was pretty... ahem.. loud. After doing some research, I realized that this task wasn't going to be all that difficult. OK, well to me, the less steps, the easier. However, each step was extremely tedious and time consuming. Step 1: Sand the brick to remove any soot and dust. We just used a heavy grain sand paper block and it worked really well. Step 2: Vacuum really, really well so that the primer doesn't stick to the dust and soot. Very important steps. Step 3: Wash the bricks with a heavy duty brush and soapy water. Once the bricks are clean and dry, you can begin priming. Be sure to purchase primer that is meant for concrete and brick. You can get it at Lowes or Home Depot. We primed with 2 coats because after the first coat, we could still see a bit of a yellowing effect from the soot. Use a small brush to get all the crevices. Have lots of music and coffee handy. It is a very tedious job! While this was drying, we applied the primer to the red wall. Surprisingly, we only needed one coat. Then the fun begins! We used a soft white color to paint the brick. Use a thick napped roller (which i built some bicep muscles doing) and roll right on! Then go back and fill those darn crevices again. We painted the awful (fake) brick on the floor too, we are having that built up with stone! I can't wait. We repainted the mantle a brighter white so there is a pretty contrast between the two! After 2 coats of primer and 3 coats of paint, here is the final product! I am still working on the accessories, but it is pretty amazing what a change it made! Ta-Dah! I hope i have inspired you to do something outside of your comfort level! Thank you for letting me share. LOVE it. I painted my brick fireplace black last year. Best thing I did. I really love the white. What a great job!I believe that I have seen my husband do the same head scratching pose...lol It is amazing what white paint can do!  How awesome for you to be on the brooklyn Limestone! How fantastic is that? Mine is the same way...dark brown brick not my choice but Mr. K's x's. I looooove the white, what a wonderful difference it made! Looks fantastic! I would love to have a woodburning fireplace! It looks great! Totally worth the effort, and your house looks like it's really nice. We're thinking of putting a tv like that over our fireplace, but I'm wondering it it will be too high up...are you able to tilt it forward? We put our t.v up over the fireplace too. I still think it's too high, but since it was my husbands idea~ "it's perfect";) As for the question above: We bought a mount that tilts a bit, but not enough. When I lived in Georgia, we had a red brick fireplace and my husband didn't want me to paint it white. I wanted to so I waited for him to go out of town to see a football game and when he came back, it was nice and white:) I love it! Beautiful and relaxing improvement! Love the white fireplace. It really makes the room look larger. The fireplace and room makeover made such an improvement. So much work but well worth it. You are brave! The room went from colonial-ish to Pottery Barn-ish. I love the change. We have a fireplace with a wooden surround that I'm dying to paint white. My husband doesn't agree. I may just have to buy the stuff and sucker him into doing it. Thanks Mrs. Limestone for having me again and thanks everyone for the compliments! We are so glad we did it. I was SO nervous at first, but i figured it couldn't get any worse! @heather - the tv is large, so it is up a tad high, but luckily the living room is a deep enough that the sofa is set back and works well! I still love it. It sits right on the mantle so i don't think a tilt function would work in our case, although i'm not 100% sure. Looks great. I also just painted white over a maroon fireplace but I didn't paint the floor brick because I wasn't sure how it would look. After seeing yours I think I will!